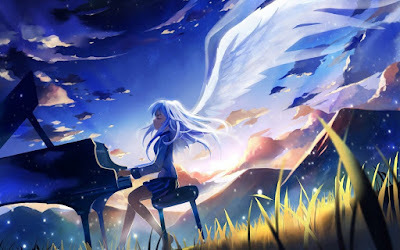 Eugene's Blog: The catechism of "Angel Beats!" As previous noted, Angel Beats! never rises to the sublime hermeneutics of Haibane Renmei, and aims for the emotional—rather than the theological—jugular (a Jun Maeda trademark). But it does tackle several substantial ideas in a creative manner. 1. Like Haibane Renmei, Jun Maeda (inadvertently) addresses the problem of infant baptism. From a Catholic perspective, all of these teenagers have arrived in Limbo, the purpose of which is to free themselves from Original Sin. In Buddhist terms, they must free themselves from impermanent and transient attachments and achieve satori, a true realization of their place in the universe and what matters from an eternal perspective. Grudges and regrets have to be left behind. This is about dealing with the past and moving on. It's not about "justice" and not about what you think the universe owes you in recompense for your suffering. As Clint Eastwood's Will Munny puts it, "Deserve's got nothing to do with it." All of the characters in Angel Beats! had miserable childhoods, perhaps Yuri the worst, hence her refusal to reconcile herself to whatever she imagines God is. But only reconciliation will allow them to live out the childhoods they were denied in morality. 2. Jun Maeda is also a game designer, so it comes as no surprise that the serpent in this garden should be a creation of computer programming. Indeed, the students who are not aware that they died and are in the afterlife are called "non-player characters" (NPCs). Here Angel Beats! again resembles The Matrix, though Agent Smith never compellingly tempts Neo with an offer to rule in the virtual rather than serve in reality. But Yuri is offered what she imagines she's been fighting for all along. This scene aligns with two themes explored in depth by C.S. Lewis, that we mortals are fighting on enemy territory but both sides are bound by a specific set of rules. The serpent is doing what he's allowed to do. So agency trumps order even in the afterlife. 3. The "big reveal" introduces a backstory that is told and not shown, which would seem a narrative mistake, until it becomes clear that Otonashi's story embodies it. In the end, Otonashi does not follow it, and so the story concludes on a very Buddhist note. Because it is only by breaking out of the present eternal cycle (samsara) and being reborn that the players can win at this game.